The author and TV host on King’s most important year. Tavis Smiley is the host and managing editor of Tavis Smiley on PBS and author of Death of a King: The Real Story of Dr. Martin Luther King Jr.’s Final Year, which has just been published in paperback. This interview has been edited and condensed. Jon Wiener: After King’s speech at Riverside Church in April 1967, where he came out against the war in Vietnam and called the US “the greatest purveyor of violence in the world,” The New York Times called the speech “disastrous, wasteful and self-defeating,” The Washington Post said King had done “a grave injury to his natural allies and even graver to himself,” and Life magazine said it “comes close to betraying the cause.” What was all that like for him? Martin was depressed at times; sometimes he’d cry himself to sleep. He knew there was a bullet with his name on it. Tavis Smiley: Martin was depressed at times in that last year, despondent at times; sometimes had to cry himself to sleep. He knew there was a bullet out there with his name on it. He’s catching hell and hate from everybody. Inside his camp, he has to deal with his own board voting to condemn him for coming out against the war. He doesn’t know that his treasurer James Harrison is on the FBI payroll, or that his photographer Ernest Withers is on the FBI payroll. He’s being sold out from the inside, he’s catching hell and hate from the outside; the media is against him, the White House is against him, white America is against him, even black America is against him. And every day he’s trying to find the courage, the commitment, the character to keep trying to tell the truth as he knew it. He has to pull and pray himself through the depression, the despondency and the mania that he was feeling. In the last year of his life Martin is hospitalized a number of times. The official reason was always “exhaustion.” And to be sure, he was running from pillar to post, on the move all the time. Listen to Tavis Smiley on the Start Making Sense podcast. The year that began with the furor over King’s Vietnam speech ended of course in Memphis. What was King’s Memphis campaign about? So Memphis becomes a jumping off point for the national campaign. Against the advice of all of his staff, King says “we’re going to Memphis.” The first march there ended in violence. 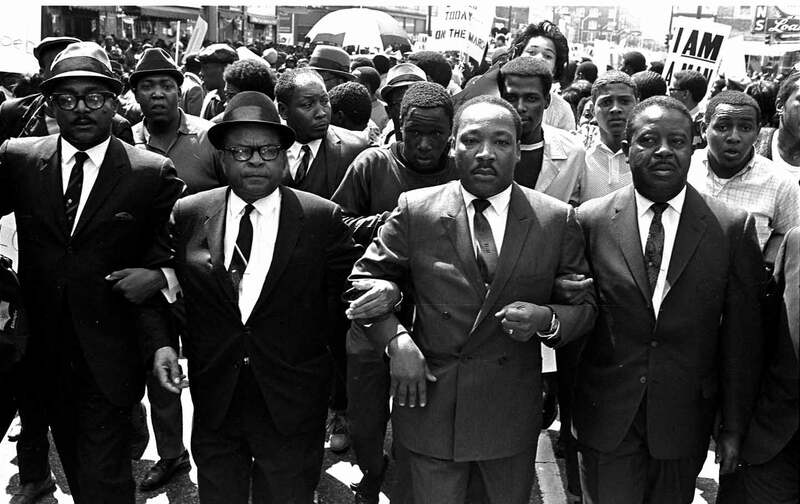 He said “we’re going back, and we’re going to do it right.” Of course King was assassinated [on April 4, 1968] before that second march happened. They went through with it anyway; Coretta continued that fight. You’ve written something like 16 books—what was it like for you to write this one about King’s final year? The greatest joy of my life. The last year is the most dynamic year of King’s life and shows you who Martin really is. When all the hell and all the hate is coming at him, Martin doesn’t back down. He doesn’t falter. He doesn’t give in. This is the Martin I love the most. I love this Martin more than the Martin of the Montgomery Bus Boycott, more than the Martin of the March on Washington, more than the Martin of Selma and the Voting Rights Act, more than the Nobel Peace Prize. I love this Martin the most because he would not let misery have the last word. Martin was going to speak his truth. And all these years later we see that Martin was right. Our society pays a heavy price when we ignore the truth-tellers amongst us. It’s not easy to tell the truth these days, because people are so cynical. Look at Martin, and you see what happens when you tell the truth. They abandon you, and then they isolate you—and that makes it easier for somebody else to assassinate you. What price does our society pay when we ignore people telling us the truth about the environment, climate change, and global warming? This ain’t no joke. When we ignore the truth-tellers about poverty threatening our democracy? We don’t want to hear the truth about a drone program on steroids that’s killing far too many innocent women and children and making more enemies for us. We don’t want to hear the truth about torture at Guantánamo. We certainly don’t want to hear the truth about the money in our politics. Long-term, we’re going to pay a heavy price for that. King’s last year shows us that somebody, somebody has got to tell the truth.